As part of the 2018 Auckland Heritage Festival, we were pleased to join with Holy Trinity Cathedral for a delightful event in St Mary’s church. Dr Philip Smith, the Cathedral organist, gave a presentation followed by a programme of organ music culminating in Sir Edward Elgar’s Pomp and Circumstance March No. 4. In his address, Philip told us about the organs in St Mary’s. The small original organ was powered by water – the air was produced by two paddles turned by the stream of water. This was a very wasteful method with the water going down the drain and the locals complained as the water pressure dropped dramatically every time there was a service in the church! After WWI electricity was used to power the organ. 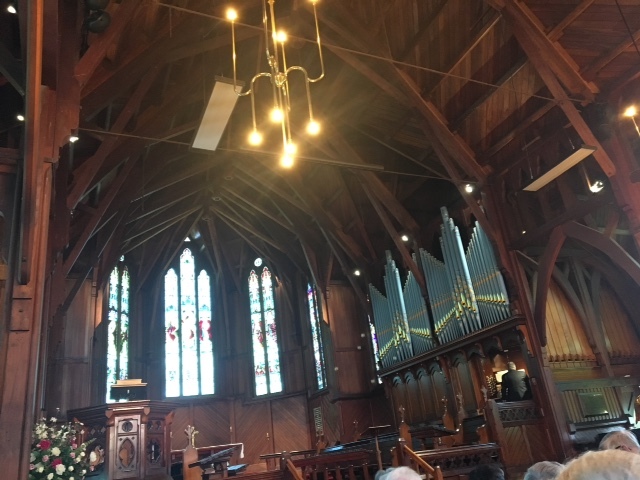 The current organ was built in 1909 by Auckland organ builder, George Croft. The metal pipes for the organ were brought over from England and the wooden pipes were made here. In the 1980’s, the ivory keys were replaced with plastic, but these have now been replaced again with cow bone. When it was built it was the largest organ in Auckland. At that time and without access to radio broadcasts, it was difficult for people to enjoy full orchestral concerts. Thus the organ could give renditions of orchestral music to be enjoyed by all. We met on the evening of Thursday 13th September for our Thirteenth AGM at the delightful Quality Hotel in Gladstone Road. With nearly forty people attending, Co-Chair Mary Barry gave her report and after the formal part of the meeting, we welcomed David McGregor, Chairman Te Araroa Trust (The National Pathway). Established to honour those New Zealanders who served overseas in WWI, David spoke about The Fields of Remembrance Trust and outlined the work done, especially with schools. Nearly 80,000 white crosses have been supplied to 2,531 Primary and Secondary schools and mini white crosses were supplied to 4,600 Early Childhood Centres with the aim of informing and inspiring younger generations. David spoke about the plans for The Domain to commemorate the 100th anniversary of Armistice Day when a Field of over 18,000 white crosses will be established, each bearing the name of a man or woman who died in the conflict. The Field will be below the Court of Honour and Cenotaph in front of Auckland War Memorial Museum and will be on display from 22nd October to 21st November 2018. A separate Brothers’ Field will be established by the lone Gallipoli Pine to commemorate those families who lost more than one son or daughter. There will be light boxes to talk people through the various aspects of the War. The Service of Remembrance will be held at 11am on Sunday 11th November 2018. Mr Bill McKay, BArch Hons, Senior Lecturer, School of Architecture and Planning, University of Auckland, gave us an in-depth look at war memorials through the years. The Crimean War and the US Civil War were the first modern wars when news of the carnage suffered was spread directly to the public, thus triggering the war memorials. The first memorial was built in London in 1861 for the fallen in the Crimean War. In New Zealand, the memorials commemorated the fallen in the South African wars, WWI and WWII, the memorials to the Land Wars in NZ occurring later, about 15 years post Boer War. 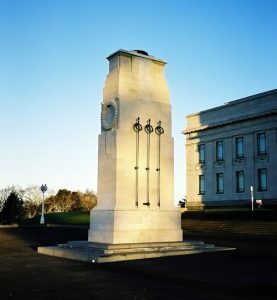 The first Auckland cenotaph was a temporary structure made of wood and plaster, a scaled-down replica of the cenotaph designed by Edward Lutyens in Whitehall, and first erected in front of the Auckland Town Hall in time for Anzac Day 1922. The permanent cenotaph, the plans for which were drawn up by Grierson, Aimer and Draffin, was also a replica of the Whitehall cenotaph, but this time was set on a foundation of Coromandel granite and was constructed of concrete faced with Portland stone. Utilitarian, or ‘living’, memorials were encouraged in New Zealand, where people can walk in each day and remember their dead. There are many War Memorial halls, libraries, hospitals, bridges, swimming pools, parks, maraes and school entrances, that continue to serve this purpose. It was hoped that these places would prevent future wars and encourage peace through a sense of community. The first Labour government donated a ‘pound for pound’ subsidy to encourage this process. Please click https://parnellheritage.org.nz/wp-admin/post-new.php to access our September 2018 Newsletter. Please click https://parnellheritage.org.nz/wp-admin/post-new.php to access our June 2018 Newsletter.